Nicocure Review and Results: Does Nicocure Work to Help Stop Smoking? Nicocure is an all-natural herbal formula that eliminates the body's need and cravings for nicotine. The product consists of a homeopathic liquid sublingual (under the tongue) spray which contains ingredients to quickly combat symptoms associated with nicotine withdrawal, including nausea, cold sweats, shortness of breath, stuffy head, aches and pains, insomnia, increased appetite, and irritability. The recommended dosage is two sprays under the tongue three times a day. The product's effectiveness is increased by also taking the companion product, an herbal supplement in capsule form, once per day. The Nicocure system also features a program to help deal with the psychological issues associated with smoking. This feature is helpful since smoking addictions have both physical and psychological components. Black Spruce (Abies Nigra), which relieves headaches, upset stomach, hunger pangs, and coughs. Monkshood (Aconitum Napellus), known for its properties of calming mind and body, relieving coughs, and soothing chest pains. Oats (Avena), which helps to sooth the nerves. Poison Nut (Nux Vomica), known for fighting food cravings and decreasing stress levels. St. Ignatius Bean (Ignatia Amara), which relieves stress, abdominal pains, cramping, headaches, and heaviness in the chest. Plantago Major, helpful for treating cold symptoms and coughs; also increases aversion to tobacco. Lung Wort (Stricta Pulomaria), which combats general malaise from nicotine withdrawal, and relieves headaches and joint stiffness. Tabacum, known for improving concentration and reducing tobacco cravings, nausea, dizziness, and confusion. Quibracho, which relieves shortness of breath and promotes healthy respiratory action. Lung (Pulmo-porcine), known for improving respiration and relieving lung inflammation. Arsenicum Iodatum, which relieves burning sensations in the throat and nose and calms coughs. Lobelia Extract, which promotes relaxation and eases breathing. Licorice Root Extract, known for relieving coughs and soothing inflammation. Passion Flower, helpful for relieving stress and insomnia. Coral Calcium, known for detoxification properties and strengthening the immune system. Ginger Extract, which relieves nausea and cold-type symptoms. Linden Flowers, known to soothe nerves and relieve indigestion. Mullein Root, which helps so soothe coughs and irritated throats. Spearmint Leaves, known for their cleansing properties. Hawthorne Berries, helpful in promoting digestive health and increasing circulation. Update: Nicocure has recently been renamed Smoke Deter, which can be purchased online without a prescription. See our complete Smoke Deter review. Customers who have used Nicocure have mostly positive things to say about the product. They mention that taking Nicocure lessened their cigarette cravings, and they suffered few side effects. The best success rate for stopping smoking with Nicocure was among those customers who had a strong desire to quit smoking. Unlike some other stop smoking products, users reported no drowsiness or weight gain. 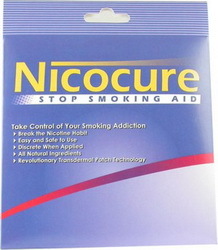 Several users of Nicocure reported that the formula stopped them from smoking for just a short time before they started smoking again, but they were a small minority of those customers reviewing the product. Nicocure's natural homeopathic ingredients can be effective in helping to stop smoking, but scientific research has not proven the effectiveness of the minute homeopathic levels included in the product. For a more potent but still natural product to help with stopping smoking, reviewers have found that the ingredients found in NicRx are more effective in curbing their cravings for cigarettes while avoiding adverse side effects.